Panasonic adds AirPlay to range of CD, iPod and wireless systems | What Hi-Fi? 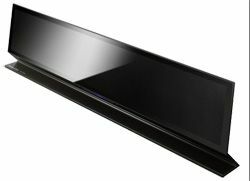 Panasonic has confirmed a host of audio products that are set for the UK, including the company's first AirPlay speaker. There are also CD/iPod micro systems and an ultra-portable Bluetooth speaker. The SC-AP01 AirPlay system has a "wireless metal bar" design with nano-sized bamboo cone speakers. AirPlay supports streaming from Apple iPad, iPhone, iPod Touch and iTunes, and there's also a free Panasonic Remote Control app. A USB input allows you to charge your iDevice, too. Also new was the SC-GT07, with a "modern classic guitar box design" with an iPod/iPhone dock at the entrance to the pseudo sound box and a rotary volume control. If you want something more portable, then the SC-M07 is a small, disc-shaped portable speaker, powered by 2 x AA batteries or via USB. With Bluetooth integrated, you can stream from any compatible device. Also new is a range of micro systems. All have iPod/iPhone docks, offer CD playback and FM radio. The top-of-the-range SC-HC57 adds Apple AirPlay to the specification list and compatability with the new Remote Control app to control EQ settings, the sliding door in front of the dock and CD player, and more. The SC-HC57 and step down SC-HC37 feature Direct-Vocal Surround, the high-quality metal finish and the sliding door design. Both can be wall-mounted and both support the vTuner app for internet radio. An entry-level SC-HC27 keeps it simple with USB input and CD playback.